Squeezed By U.S. Sanctions, Iran Has Had An Especially Bad 2018 The Trump administration hit Iran with sanctions after pulling out of the nuclear deal. That's hurt the Iranian economy — and emboldened hard-liners. 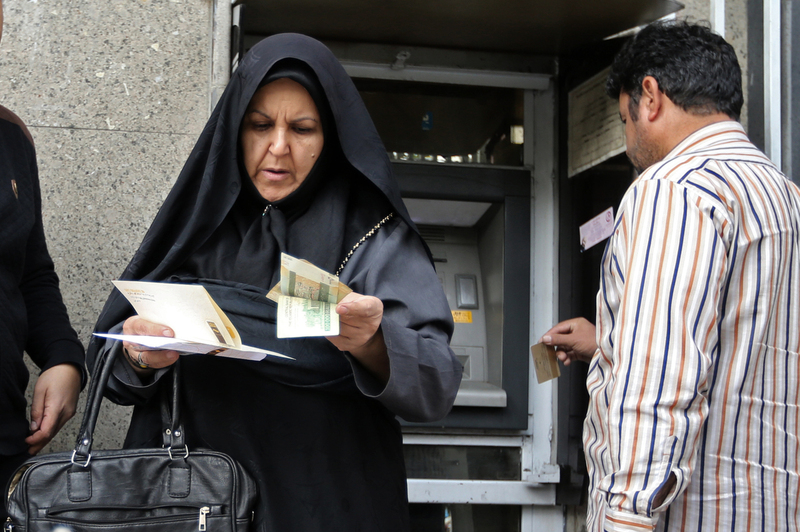 People withdraw money from a bank machine in the Iranian capital Tehran's Grand Bazaar in November, months after President Trump announced in May he was withdrawing from the 2015 Iran nuclear deal and reimposing sanctions on the country. The European Union, one of the deal's signatories, vowed to create a mechanism to keep doing business with Iran despite the American sanctions, but so far it hasn't materialized. The results to date have included defiant rhetoric from Iranian leaders, economic pain felt by ordinary Iranians and a political weakening of President Hassan Rouhani, who's under increasing attack from hard-line conservative forces. Iran's state-run media run stories almost daily featuring top officials ridiculing Washington's Iran policies and threatening dire consequences if its oil exports are blocked. "The U.S. has threatened to deprive Iran of selling oil and stop it from having trade with the world," the state-run IRNA news agency quoted President Rouhani as saying this month. Rouhani went on to say that America would fail to accomplish that goal, and warned that if it somehow did come to pass, "no oil will be exported from the Persian Gulf." That was a reference to threats by Iranian military commanders to block the Strait of Hormuz, a narrow waterway through which an estimated 20 percent of the world's oil flows. Said, a 38-year-old electrical engineer from Tehran, told NPR via Skype in November that imported goods such as electrical components, heavily affected by the value of the dollar, had quadrupled in price since the U.S. pulled out of the Iran deal in May. (Essential goods have seen smaller price rises, thanks in part to government subsidies.) He says Trump deserves some of the blame, but so does his own government. The electrical engineer would only give his first name for fear of retaliation against himself or his family. "Most of the people I know don't approve of President Trump's behavior," he said, "but they're also very skeptical about the performance of the Iranian government. "We're not political experts," he went on, "but we can see these decisions are affecting our day-to-day lives very negatively." Said predicted there will be more protests like the ones that erupted in cities around Iran at the end of 2017. Demonstrations have flared up from time to time since then, usually centered on economic complaints. As this unpredictable standoff between the U.S. and Iran unfolds, economists, analysts and politicians are wondering what will come next. World oil markets had already factored in a sharp decline in Iranian oil production after Trump's threats earlier this year, only to be forced to recalculate when the generous waivers were issued to Tehran's biggest customers. Even now, analysts say it's impossible to say exactly how long these waivers will last, suggesting volatile markets ahead in 2019. The widespread international condemnation of the killing of a Saudi journalist after he entered Saudi Arabia's Consulate in Istanbul in October is seen by analysts as a gift to Iran, saddling its main Persian Gulf rival with an embarrassing controversy just as the White House seeks to exert "maximum pressure" on Tehran. President Trump has stood by Riyadh, even after it changed its version of what happened to journalist Jamal Khashoggi several times, prompting Trump to call it "one of the worst in the history of cover-ups." But while Iran's leaders may enjoy watching troubles mount for Saudi Arabia, Iran's pragmatic President Rouhani has plenty of troubles of his own. Hard-liners who warned against making a diplomatic agreement with the U.S. have been vocal in their condemnations since Trump pulled out of the nuclear deal and reimposed sanctions. Iran's Supreme Leader Grand Ayatollah Ali Khamenei weighed in as well, saying in August that the nuclear deal, Rouhani's crowning foreign policy achievement, was a mistake. He also said the poor state of Iran's economy should be blamed on Rouhani's government. Emboldened hard-liners in Iran's parliament began singling out members of the cabinet for attack, including the U.S.-educated Foreign Minister Mohammad Javad Zarif. All of which leaves ordinary Iranians wondering when things might start to get better. Parisa, a 30-year-old student, told NPR that people want to know what the Islamic regime is going to do, besides saying no more deals with the U.S. She also gave only her first name because she feared retaliation for criticizing the regime. "That's our policy — we are against America," she said in August. "And at the other hand, people are getting more disappointed ... especially people are getting poorer. And who knows what will happen next?"